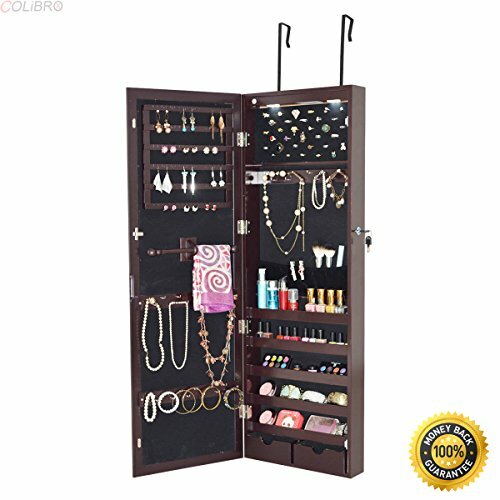 ✔️ PERFECT QUALITY--This Is Our Brand New And Elegant Jewelry Cabinet, Which Is Perfect For Organizing And Storing Your Favorite Rings, Necklaces, Bracelets. Made Of High-Quality MDF, This Jewelry Cabinet Is Sturdy And Durable. Designed As A Wall Moubted Or Door Mounted Jewelry Cabinet, It Is Space-Saving. It Is Equipped With A Big Mirror And Owns A Powerful Storage Capacity. ✔️ For Its Built-In Different Compartments And Separate Hooks, You Can Save Your Favorite Accessories Safely And In An Organized Manner. It Makes It Easy To Choose Your Jewelry In The Morning Without The Frustration Of Looking For Loose/Missing Pieces. Organize Valuables And Display An Elegant Furniture In Your Home. Don't Hesitate To Add It To Your Cart! ✔️ Brand New And High Quality Space-Saving Wall/Door Mounted Design, Maximizing Your Room Made Of Premium MDF, Sturdy And Durable An Elegant Full-Length Mirror Powerful Storage Capacity Dressing Mirror And Jewelry Cabinet Cleverly Combines Features LED Lights(Auto Lights Up When Open The Door), Making Your Jewelry More Dazzling Safe & Secure Storage: Features A Lock And Keys To Protect Jewelry, Makeup, Or Other Accessories Easy To Assemble Perfect For Bedroom, Jewelry Shop. ✔️ Color: Brown Material: MDF Type: Wall/Door Mounted Overall Dimension :14.6"× 3.8" × 43.3" (L×W×H) Mirror Dimension:11"Wx 39.8"L Quantity Of Battery: 3*AAA (Not Included) Quantity Of LED Lights: 8 Package Includes: 1 × Jewelry Cabinet.